1870. HAWTHORNE, Nathaniel. Passages from the English Note-Books of Nathaniel Hawthorne. Original blindstamped pictorial cloth, spines gilt, housed in custom cloth slipcase. Boston: Fields, Osgood, & Co., 1870. 2 Vols. First edition. BAL 7634. Light uniform toning, else a very good or better set. 2004-07-02. New. Ships with Tracking Number! INTERNATIONAL WORLDWIDE Shipping available. Buy with confidence, excellent customer service! 2010-08-17. Good. Ships with Tracking Number! INTERNATIONAL WORLDWIDE Shipping available. May not contain Access Codes or Supplements. May be ex-library. Shipping & Handling by region. Buy with confidence, excellent customer service! Boston: Fields, Osgood & Co, 1870. Good. First American edition. Two volume set. Blind-stamped green cloth, with gilt decoration on spines. Edited by Sophia Hawthorne. Ex-library with bookplate and penned notation on front pastedowns, sticker on spines, hinges cracked in volume one, spines cocked, a good only set. "Nathaniel Hawthorne's Works." 20110111. Good. Ships with Tracking Number! INTERNATIONAL WORLDWIDE Shipping available. May not contain Access Codes or Supplements. May be ex-library. Shipping & Handling by region. Buy with confidence, excellent customer service! 2009-11-13. Good. Ships with Tracking Number! INTERNATIONAL WORLDWIDE Shipping available. May not contain Access Codes or Supplements. May be ex-library. Shipping & Handling by region. Buy with confidence, excellent customer service! London - Strahan and Co., 1870 Book. GOOD ONLY. Hardcover. First edition.. A two volume first edition of this collection excerpts from Nathaniel Hawthorne's notebooks. Hawthorne was a Nineteenth Century American novelist, known particularly for his work's reflection of New England, its Puritan history and moral allegories. This use of moral tales and allegory received Hawthorne some somewhat negative contemporary reviews, particuarly from Edgar Allan Poe, but is now considered one of the great American authors. Condition: In decorative morocco binding with gilt detailing. Externally sound, there is some wear and markings to the boards, extremities, backstrip and joints. The hinges are very tender on both volumes. Internally, the pages are firmly bound and are bright and clean throughout. Overall: GOOD ONLY..
2004-07-02. Good. Ships with Tracking Number! INTERNATIONAL WORLDWIDE Shipping available. May not contain Access Codes or Supplements. May be ex-library. Shipping & Handling by region. Buy with confidence, excellent customer service! 2009-11-07. Good. Ships with Tracking Number! INTERNATIONAL WORLDWIDE Shipping available. May not contain Access Codes or Supplements. May be ex-library. Shipping & Handling by region. Buy with confidence, excellent customer service! Kessinger Publishing, LLC, 2004-07-02. Paperback. Used:Good. Boston, MA: Houghton, Mifflin and Company. Good. 1870. Hardback. The cover is leather and marbled. ; Vol. 1; 369 pages . 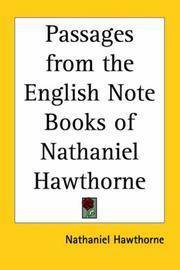 --passages From The English Note-books Of Nathaniel Hawthorne: Two Volumes In One..
Nabu Press, 2012-04-02. Paperback. Good. Boston: Fields, Osgood, and Co., 1870. Hard cover is in very good condition with slight wear to corners and some wear to spine. Is unmarked. A Copy for it's Age !!. Hard Cover. Very Good/No Jacket. 2019. Leather Bound. New. Leather Binding on Spine and Corners with Golden Leaf Printing on round Spine (extra customization on request like complete leather, Golden Screen printing in Front, Color Leather, Colored book etc.) Reprinted in 2019 with the help of original edition published long back . This book is printed in black & white, sewing binding for longer life, Printed on high quality Paper, re-sized as per Current standards, professionally processed without changing its contents. As these are old books, we processed each page manually and make them readable but in some cases some pages which are blur or missing or black spots. If it is multi volume set, then it is only single volume, if you wish to order a specific or all the volumes you may contact us. We expect that you will understand our compulsion in these books. We found this book important for the readers who want to know more about our old treasure so we brought it back to the shelves. Hope you will like it and give your comments and suggestions. Lang: - eng, Pages 836. EXTRA 10 DAYS APART FROM THE NORMAL SHIPPING PERIOD WILL BE REQUIRED FOR LEATHER BOUND BOOKS. COMPLETE LEATHER WILL COST YOU EXTRA US$ 25 APART FROM THE LEATHER BOUND BOOKS. Kessinger Publishing, LLC, 2004-07-02. Paperback. Good. British Library, Historical Print Editions, 2011-01-11. Paperback. Good. Bernhard Tauchnitz, 1871. Pages: 408; Weight: 8.8oz; Size: 5.9" x 4.7" x 0.8". Cover has moderate edgewear, bumped corners and spine ensa, small water stains on spine and beck cover, name inside front cover, some notes in pencil on front endpaper, flyleaf is loose, otherwise clean, unmarked, tight. . Good. Hard Cover. . . .
Boston: James R. Osgood, 1871. Hardcover. Very Good/No Jacket. 12mo - over 6¾ - 7¾" tall. This book is clean, tight and square with good corners. It is signed on a front end paper by Amasa Norcross in his incredibly tidy hand; otherwise it is unmarked. Norcross (1824-1898) represented the Massachusetts 10th district for a couple of terms. There's some very light bumping/rubbing mainly at the ends of the spine. The boards are blind stamped with a young fellow in fig leaf and sash and covered with green cloth. It has gold titles and designs on the spine. It has brown end papers and 410 pages. Boston: James R. Osgood, 1874. early edition. Hardcover. Very Good. I believe this is the first edition with two volumes in one.No writing in the book - not even an owners name.Full refund if not satisfied.